Opened by the popular Mr Lorbak, the nondescript space does not stand out from its neighbours in terms of decor, but service is prompt and sincere, with a large banner of reviews and pictures inviting diners to try their claypot creations. 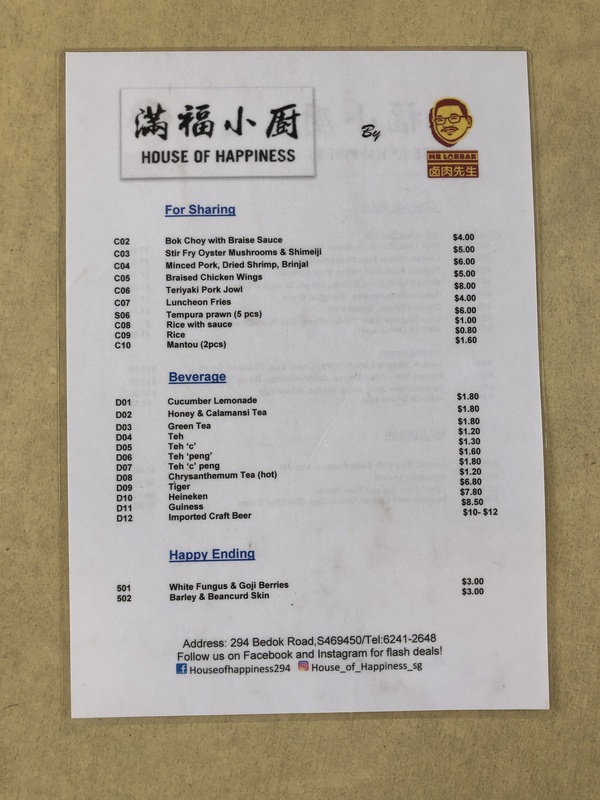 While the menu is kept compact, House of Happiness manages to cater to different tastes and dietary needs. Fans of Mr Lorbak will take comfort in the Lorbak, Onsen Egg, and Shanghai Green Claypot ($7), while vegetarians can tuck into the Assorted Mushrooms and Shanghai Green Claypot ($7). Other toppings include minced pork, chicken wings, and even teriyaki pork jowl. The Ikura, Tobiko, and Onsen Egg Claypot ($11) stands out as the priciest dish at House of Happiness. Topped with a perfectly cooked onsen egg that is generously decorated with a ring of ikura and tobiko, this claypot packs considerable visual appeal. No prizes for guessing this premium dish is aimed at drawing the Japanese loving crowd. Upon mixing the ingredients, I was greeted with non-stop bursts of umami, along with the popping textures of the ikura and tobiko. Definitely an unusual rendition of claypot rice, with the flavours and textures almost complimenting the smokiness of the rice. The single serving lacks meat, which left me longing for some much needed protein. Carnivorous customers may want to share a Double Portion ($18) for their money’s worth. Credit where credit is due, though – it really does have a hell lotta roe. A clear broth of dashi and watercress accompanies every order of claypot rice. Comforting and refreshing, the soup helps clear your tastebuds between every few spoonfuls of rice or so. Wish there were unlimited servings of the soup! Feeling a bit peckish? House of Happiness also dishes up some hearty sides for sharing, like the Luncheon Fries ($4) served with mayo. Depending on which claypot you chose, you can get your protein or veggie fix from House of Happiness’ extensive list of side dishes. 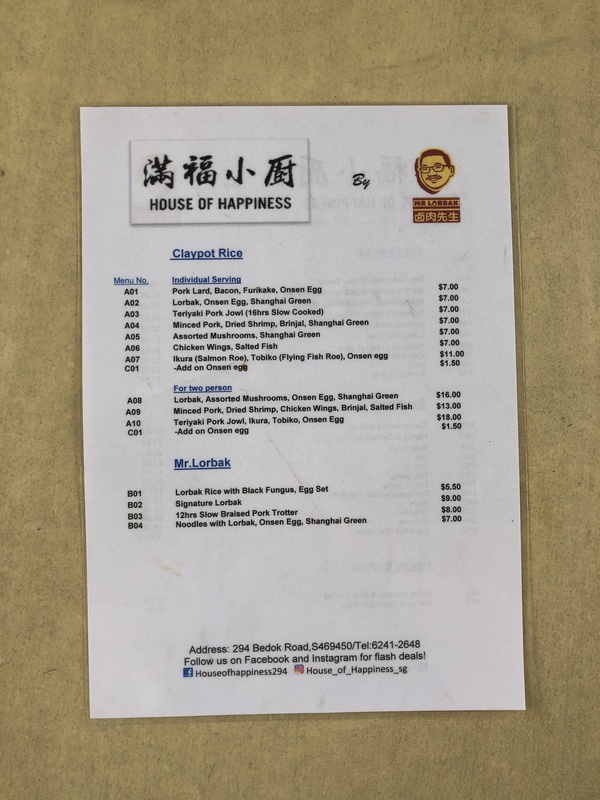 With portions on the smaller side, House of Happiness is a decent option to get your claypot fix while still keeping somewhat within your calorie budget (for those who are counting). Will definitely check out the other claypots when I’m back!